My two year old asked me for a dragon. And I don’t know about you, but we don’t exactly have a surplus of dragons in our area. 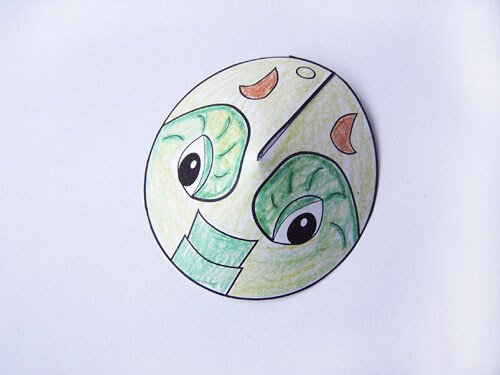 My first thought was to doodle out a dragon on a piece of paper – my usual response when my kiddos give me an odd request like this. But wouldn’t it be more fun if I could give him a dragon he could actually play with? Talk about feeling like supermom. So I told him I’d see what I could do, and I started sketching and cutting some paper out. When I was a kid, I had this goofy little marionette toy. I don’t even remember where I got it or what kind of creature it was supposed to be, but it hung on simple strings from this plastic from. It was a silly toy, but I actually had a lot of fun with it (and not just because I could run around chasing my brother with it). For some reason, that toy popped into my head as I was sketching out this dragon craft. Neat idea, I thought. But I didn’t have a plastic frame to hang a puppet from. And even if I did, I enjoy making crafts that are easy for parents to do with their kids, not ones that require buying special materials. I almost dismissed the whole idea as too ridiculous. Okay, maybe a little different than that. But you know what I mean. Well the persistent idea didn’t leave. After a quick search around the house, I found the perfect way to make the frame and strings. So if you have just a few items – printer, paper, cardboard (any other Amazon Prime members out there drowning in cardboard boxes? 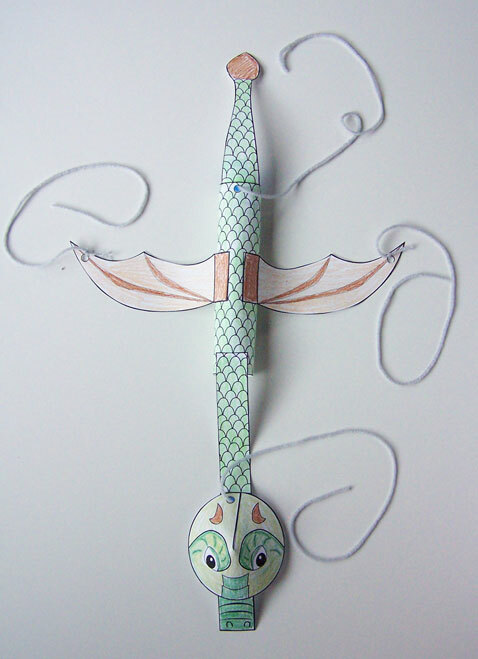 ), and yarn- you can make your own marionette dragon with your kids. 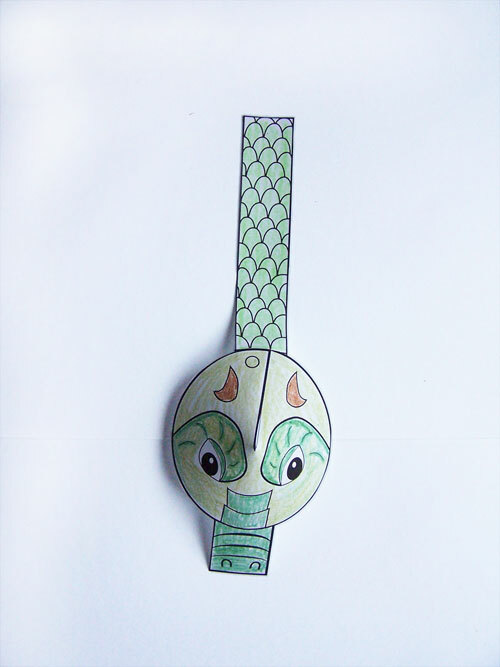 Click here to download the printable dragon marionette puppet template. You can watch the video tutorial here, or follow along with the instructions below. 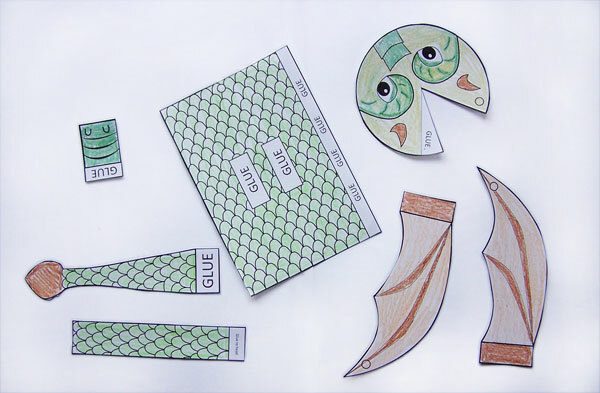 Color and cut out the pieces. Attach the nose and the neck to the head. Glue the wings, tail, and neck to the body. Punch holes at the base of the head, base of the tale, and one each wing, where the circles are. Cut 4 pieces of yarn. 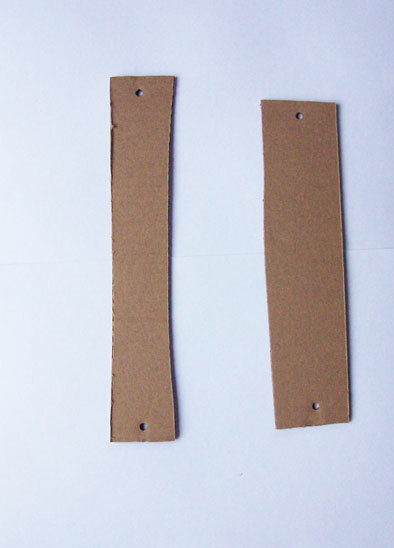 Make them a good length and you can adjust and trim as needed once it’s time to attach them to the cardboard. Tie a piece of string to each wing. For the head and tale, thread the yarn through the hole and then tape it to the underside of the dragon. Now that we have the string attached to our puppet, we need some sticks. So go grab one of those cardboard boxes I know you probably have lying around your house. Cut out two strips from strong cardboard, one slightly shorter than the other. Mine were 11 inches long (for the head and tail strings) and 12 inches long (for the wing strings). Punch a hole near the end of each one. 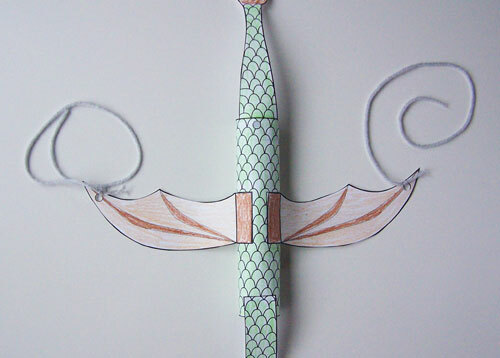 Attach the strings from your dragon to the cardboard using the shorter piece for the head and tail, then the longer piece for the wings. 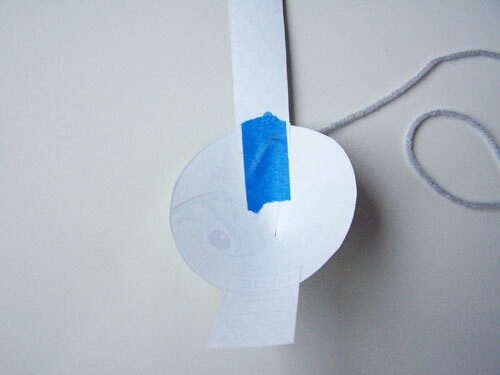 Adjust the lengths of your string as needed until you’re happy with how the dragon hangs from the cardboard. 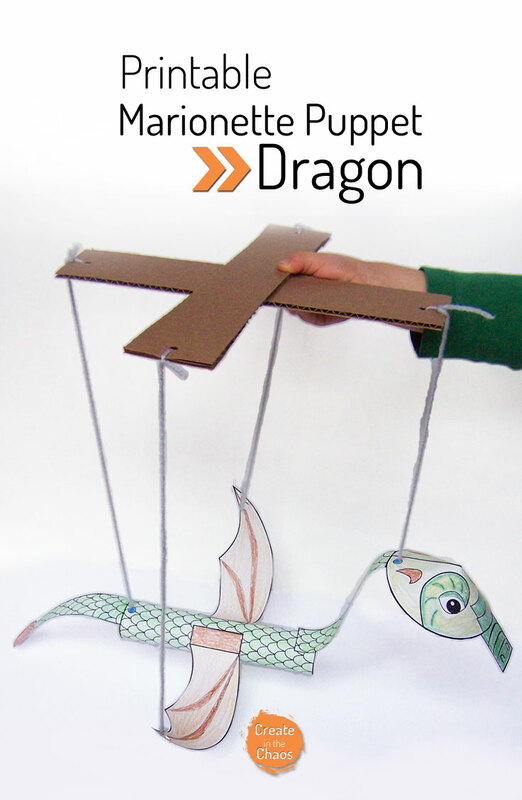 And there you have it…a dragon marionette puppet! He was so excited when he finally got to play with it. 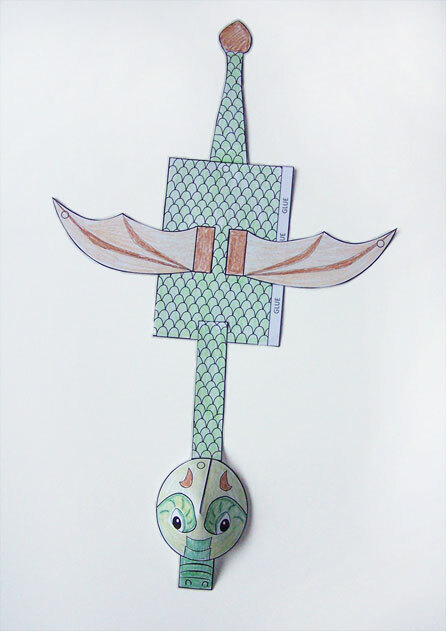 So if your kiddos love dragons and you, too, don’t have many in your neck of the woods, I hope you enjoy this fun little craft. 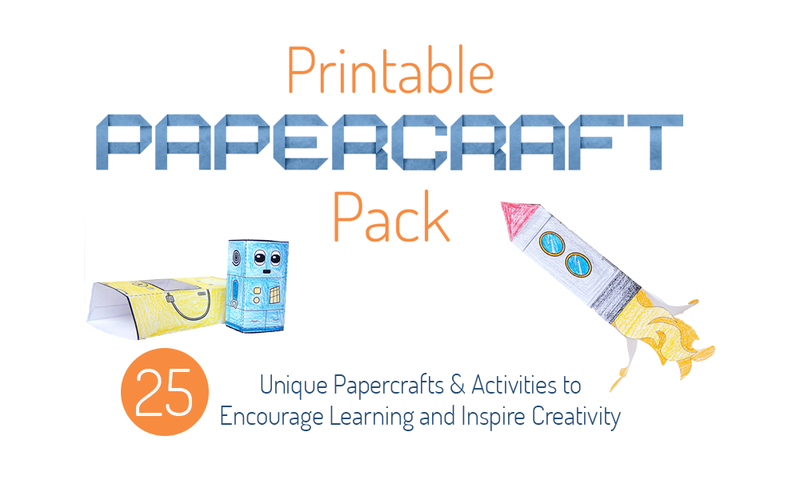 At the very least you’ll use up part of one of your cardboard boxes, and you may even make your kiddos day with a fun craft they can play with. 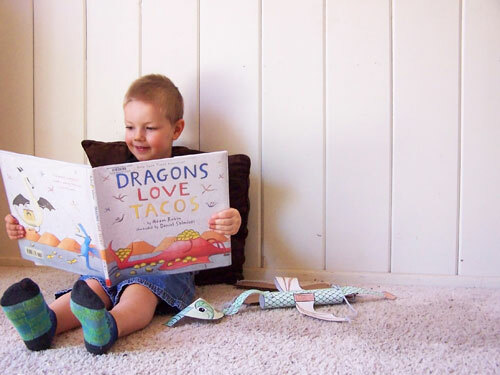 Do your kids love dragons as much as mine? 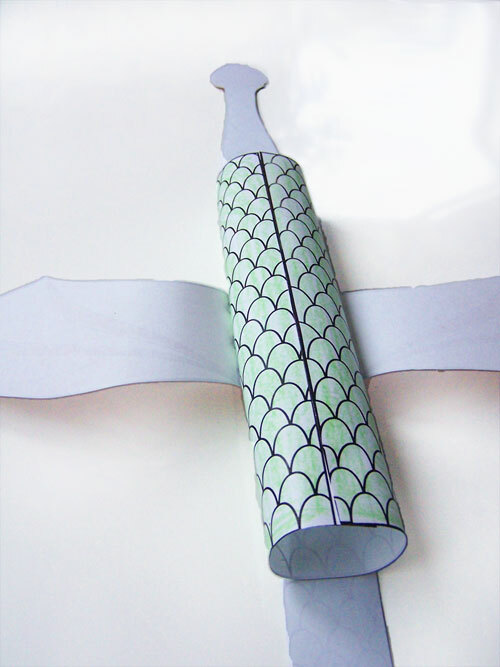 They might also enjoy this printable dragon paper airplane or this paper bag dragon puppet. Ella, I LOVE your blog. Wish I had more toddlers to do all these great activities with. You are awesome! Thanks Carlee! I’m having so much fun with it. This is SO cool. Thanks for sharing with the Frugal Family linky! This is so incredibly cute! I love it-my kids would too! And I love the photos of your little one playing with it-so adorable!! That’s is incredibly cute – the marionette and the kid! How perfect that it’s a dragon. 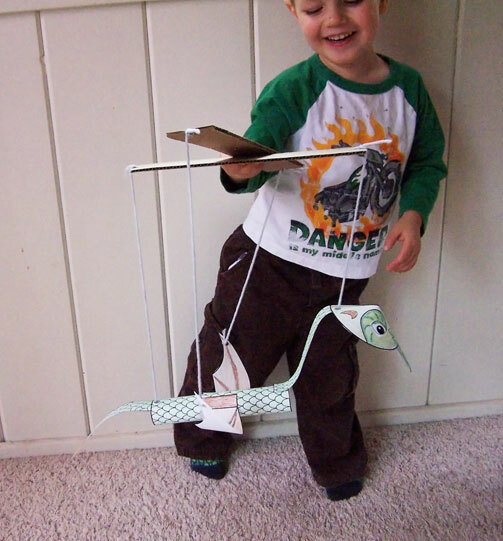 I’d never considered making a marionette before, but this looks super easy and fun! My kids would just love it. It is super easy! Easy crafts make this mama happy, heh. Hope your kiddos enjoy it! This marionette is so well done and so easy to do! Great idea!!! My boys would love this. Putting it in the file for summer crafts! 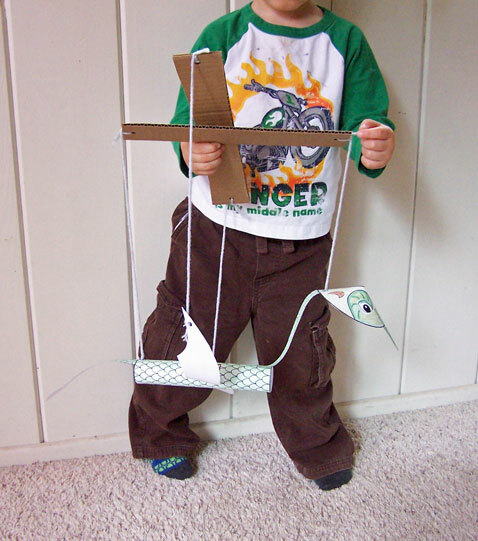 Marionettes are so fun, but I’ve never come across how to make your own! This would be a great one with the Dragon Loves Tacos books are all on it’s own! Yes, we loved this project (I think it’s my absolute favorite we’ve done so far). Thanks for stopping by!